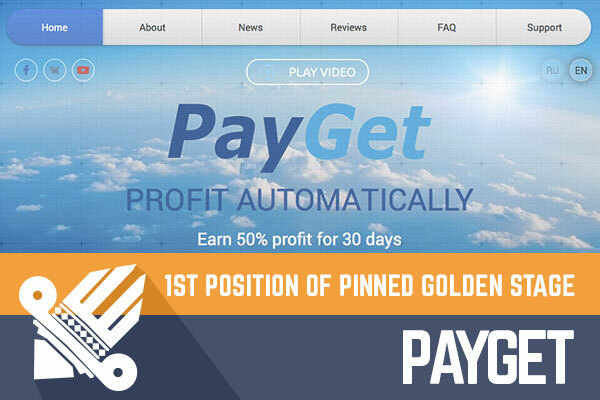 PayGet starting from the first day on DavidNews.com HYIP monitor have reserved Pinned Golden Stage - Stage One position what certifies that PayGet is not only the high budget project but professionally managed as well. PayGet online is only 20 days; therefore, it is quite a new project, and we can say for sure that there is potential for this project also for new investors that will join this project later. I find it engaging that PayGet design line, title and logo resembles famous payment processor called PayPal. Of course, I do not want to say that administrator wants to imitate PayPal because the field of each product is different, but in the general idea is excellent because that will give additional confidence for newbie investors. This project does not accept PayPal because PayPal does not approve HYIP projects in the first place. If some project accept PayPal, it is a bad sign, and I suggest to run away immediately! Projects that accept PayPal can collapse very quickly simply because PayPal likes to block funds of HYIP projects without a way to refund them. Now it is time to get back to PayGet project itself, and one thing that I like about this project (and sure thing that it attracts a huge amount of investors) is that it offers investment plan that does not resemble any other plan that I have seen in the history of HYIPs. It is common investment plan where the initial deposit is included in the payments, but the individual twist here is way how you will obtain your 150% return on your investment. So, starting from 1st to 10th day you will receive 0.20833% hourly (5% daily), then starting from 11th to 20th day you will receive 2.5% every 12 hours (5% daily) and finally starting from 21st to 30th day your return will be 5% once a day and all of that altogether will make 105% return on your investment. By the way - PayGet offers single investment plan and return will not be bigger if you will deposit larger amount. In conclusion, PayGet seems professional project that comes not just with a high budget but also with attractive investment plan and experienced administrator. At this stage, it is tough to predict how long this project will live, but estimating from what I wrote earlier I think that this project is a quite good opportunity for us - investors. In any case - invest only that you can afford to lose. Investment plans: Starting from 1st to 10th day 0.20833% hourly (5% daily), from 11th to 20th day 2.5% every 12 hours (5% daily) from 21st to 30th day 5% every 24 hours, initial deposit included in the payments. If you're searching for the best bitcoin exchanger, then you should choose YoBit. If you're trying to buy bitcoins online, Paxful is the best source for bitcoins as it allows buying bitcoins by 100's of different payment methods, such as MoneyGram, Western Union, PayPal, Visa, MasterCard, American Express and even converting your gift cards for bitcoins.